Zapped! opened in theaters on July 23, 1982. Hidden deep inside your local movie section that summer, the advertisement for Zapped! looked like this. Other movies showing in theaters at that time included Annie, The World According to Garp, The Secret of Nimh, Firefox, Rocky III, Best Little Whorehouse in Texas, ET and Young Doctors in Love. NextCult Film Club Episode 7: Mortal Kombat! I can’t say how many times I saw Firefox on cable as a kid. And played the laserdisc arcade game! At some point I plan on reading the Craig Thomas novel that the movie was adapted from. 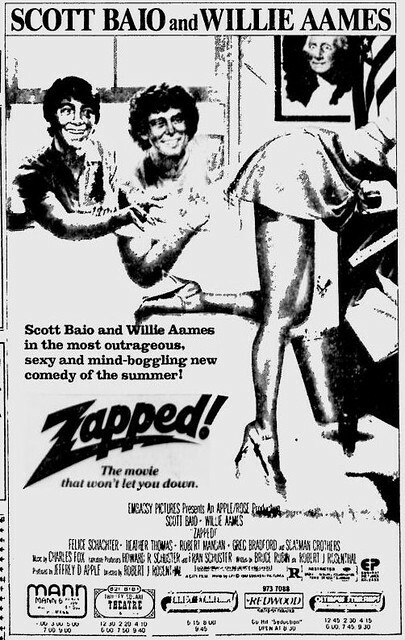 I just back today from from a few weeks overseas and didn`t get a chance to dig out my original advert for Zapped as I had planned, from memory it looks quite similar. I did however receive my ‘ No tipping sticker pack in the mail” along with a few random collector cards and hand drawn Slimer. Thanks CFC. Rad, glad it got there safe Justin!